Homemade Brahms, vol. 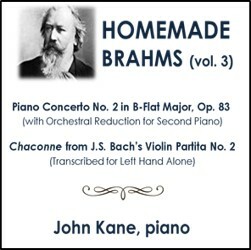 3, follows the solo Brahms album and Two-Piano Works CD to offer a 2-piano version of the Piano Concerto No. 2 in B-Flat Major, Op. 83 (with second piano part as orchestral reduction) with John Kane performing both parts and Brahms' transcription of J.S. Bach's Chaconne from his Violin Partita No. 2 for left hand alone.